GYROTONIC® is a powerful system of exercise for conditioning, stretching, strength, balance, and flexibility. The exercises build muscular strength and promote stability around the joints, enabling increased range of motion. People of all ages and all levels of fitness can participate. GYROTONIC® was developed by Juliu Horvath, who patented his ideas and designed the ergonomically correct wood crafted machines that are used for GYROTONIC® exercise. Each GYROTONIC® teacher at Kinespirit Circle is professionally certified as a GYROTONIC® Pre-Trainer or GYROTONIC® Trainer. We are experienced teachers, dedicated to designing a program for your specific needs. We work with you one-on-one. Our clients range in age from 15 to 85. Some are recovering from knee, back, neck, or other injuries and others are active people who want a balanced exercise regimen. Pilates (pronounced “puh-LAH-teez”) is a non-impact system of physical fitness that focuses on strengthening the “core,” or abdominal muscles, lengthening the body, and aligning the spine. Improved flexibility that reduces muscle soreness, enhances blood flow, and reduces risk of injury. Stronger muscles due to a combination of dynamic and static strength training. No muscle group is left unworked. Stronger abdomen, lower back, and pelvic floor. Improved physical state overall by strengthening muscles and joints and improving flexibility, making it much less likely to become injured during exercise or throughout day to day life. Experience a client-centered and individualized program that is continuously modified to ensure your growth and success. 3-dimensional and circular form that works the whole body to move efficiently and results in fluid grace, strength and mobility. Muscles, fascia, the skeletal system including your joints & spine, nervous system, and your energetic self. A weight and pulley system that gives the body both assistance and resistance promoting fluidity and elongation. Continual motions and fluidity; the use of rhythm, repetition, and flow effects gentle, gradual and sustaining change. Key alignment principles; muscular, skeletal and nervous system working together to re-educate movement patterns. A spring resistance system which is able to challenge the body in every plane. Prescribed number of repetitions; the more precise the form, the fewer repetitions are required to effect change. zone, while achieving new goals. Complement any other activity (cardio, dance, golf, skiing, swimming), increasing your performance while promoting longevity, injury prevention, quality of life, and fun. Do You Need Help Choosing the Right Method for You? We'll help you make the right decision! GYROTONIC® and Pilates can either stand alone as the physical component of your healthy lifestyle or act as the perfect complement to your fitness cross-training program. These workouts are ideal for seniors or those seeking increased energy and vitality. Our modalities provide a natural bridge between rehabilitation and full recovery. Our experienced trainers can work alongside your physical therapist to ensure continuity as you transition to the more integrated full-body approach required to progress toward your goals. GYROTONIC® puts no stress on joints and it is beneficial for anyone suffering from joint pain because it allows movement without impact. Pre and post natal Pilates strengthens stomach muscles which helps the body to better cope with the weight of your growing baby. Practicing Pilates will help to reduce back pain by exercising the deepest core muscles and stabilizing the back and pelvis. Strengthening your pelvic floor will help to support the bowels, bladder and uterus that may prevent you from leaking small amounts of urine when you cough or sneeze. You’ll practice control of your breathing, which is important for pregnancy and labour. With Gyrotonic you’ll strengthen your tummy muscles, which equips your body better to cope with the strains caused by the weight of your growing baby. Hormones make the tissues (ligaments) that connect your bones more pliable in pregnancy, making you more prone to injury. Pilates found some of its first devotees among dancers and the GYROTONIC® method was originally designed for dancers. Pilates is a great for athletes of all type to improve sports performance. The exercises work to condition the whole body, even the weaker muscles of the ankles and feet. Often athletes perform repetitive workouts each day which will make strong muscles stronger, but weak muscles will continue to become weaker. Pilates helps to prevent muscle imbalances by taking care of the body as a whole. Adding GYROTONIC® into your training regime is ideal for developing a strong inner core, and enhancing performance by building stamina, coordination, and strength. Through GYROTONIC® the entire musculature becomes evenly balanced and conditioned, and becomes less prone to injury. 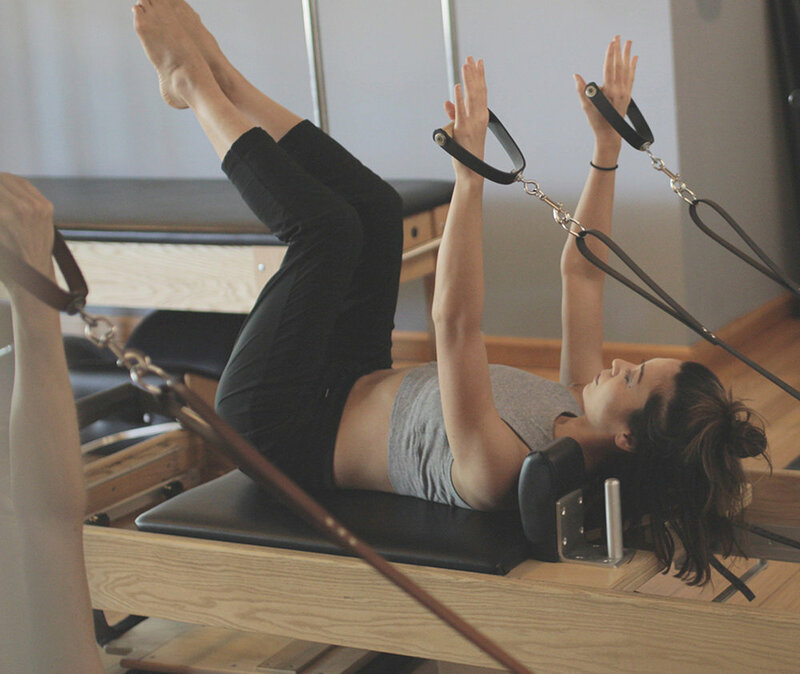 Contact Us To Discuss If GYROTONIC®, GYROKINESIS® Or Pilates Is Right For You!